OMG, plaster...My daughter talked to my forever ago about how I should try doing something on plaster! But then I got off to what I am knee deep in now, and totally forgot about it. And I'm still futzing around with my new mac and forever learning Photoshop! Luckily, you seem to have a sensible head that retains things...that's what you need for this stuff. Best of luck on the book. Hmmm plaster....I wonder if I can.. I continue to mavel at all your endeavors, congrats on the book! 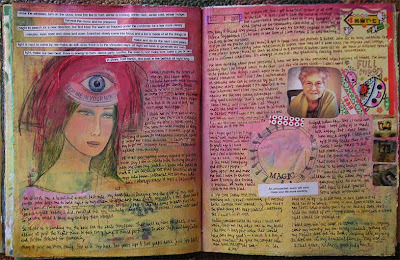 and oggling your journal pages! the best news! the two of you doing a book...squeel... the best! it will be completely amazing! absolutely! solitude and community - they each are more beautiful because of the prescence of the other - i need both - crave both! oh how i wish i was battoning down the hatches and getting winter woolies out now you lucky thing! gearing up for temps in the high 30's (celcius here!) thanks so much for all the inspiration - i love it!!! Excited to hear about everything! Was Nov. 21 the turning point of writing a book? Joint compound? That sounds interesting! Best to you on your new projects. - J.
I love your work and cant wait to see your new book. I am also a fan of Stephanie Lee. Congrats to both of you. How exciting! What a great pairing and subject for a book, I can't wait to see what you two come up with! Judy, I have to admit.. you wrote that you're up to your necks in plaster, and of course the image of you in a body cast is what I thought of...I laughed out loud as I'm sitting here enjoying breakfast @ the Hilton Garden in Kentucky...about 400 miles until home and now I'll have something to laugh about...congrats on the book deal, cannot wait to hear more about it. This is wonderful news Judy, congratulations, can't wait to see the book. Is there anything you can't do, amazing woman? So good to see a post from you today Judy. I look every day. 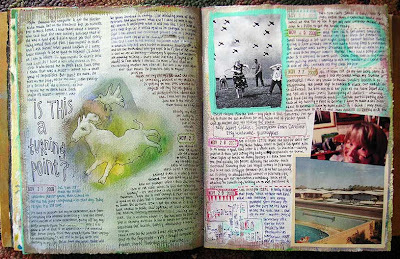 I am taking Stephanie's class on journaling and I think its wonderful that you are both collaborating on this book. It should be wonderful. Yes, I totally understand how after the solitude of endeavoring in your creativity one does need to connect again with others. I'm so glad you've done just that..!!! looking forward to the blog and books. Keep on reaching out! 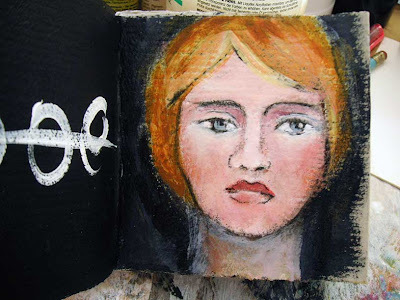 I'm so excited about your collaboration with Stephanie on this plaster book! How will we wait until 2011? It sounds like you have a few things in mind to keep us busy until then. Yippee! I need both too ! I just spent Saturday with some sweet, sweet friends from Squam (5 out of 6 of who were in your classes there with me !) having a Big Hearts Walking Play Date. So very, very good for the soul to be with artist/seeker friends who support one another so well and who share their own hearts so deeply ! It gave me such a boost that now I am dying to get into the studio and play, play play on my own, buoyed by the inspiration and the full heart I got from my time with them ! We talked about you often and in a way, you inspired me to bring them together in that judgement free play zone that was very like what you create in your classes. Life is so very very good, isn't it, beautiful, beautiful Judy ? (Think of pink unicorns flying out of butts here. ;) So glad you are living it so very well. hi, judy - glad to see you back, and what terrific news to deliver upon re-entry! 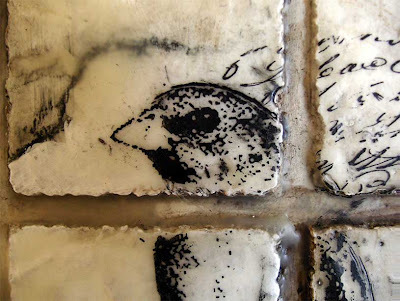 i can't wait to see this plaster collaboration and i'd love to see a book on your journal pages too. p.s. i just got back from my first trip to your corner of the country. i was totally smitten with it - if i lived there i'd never want to leave. That is a big cat! Exciting news and I look forward to the book. How exciting, Judy! What a dynamic duo you and Stephanie make. I look forward to your book! I was having trouble getting to your website for the last 48 hours (my system or the server, who knows?) to get your contact information, so I sent you a "proposal" and pictures for the call for plaster art to the email address listed on FB. I hope you've gotten it. If not, will you please let me know? I would love to be included in the gallery section. 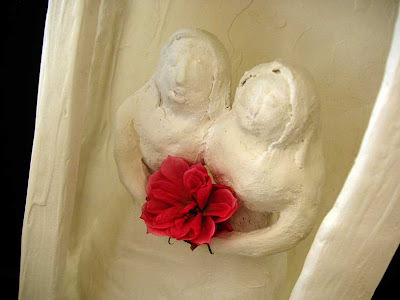 I am a handmade paper artist. 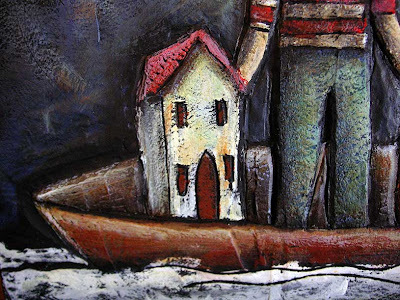 I incorporate plaster and handmade paper in pieces done on canvas. As always, love to hear what you are up to. Congratulations on your new venture and I look forward to enjoying the end result.